Finance transformation” refers to a longstanding objective: shifting the focus of CFOs and finance departments from transaction processing to more strategic, higher-value functions. 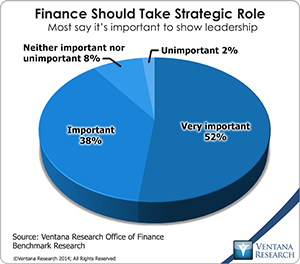 Our upcoming Office of Finance benchmark research confirms that most of organizations want their finance department to take a more strategic role in management of the company: nine in 10 participants said that it’s important or very important. (We are using “finance” in its broadest sense, including, for example, accounting, corporate finance, financial planning and analysis, treasury and tax functions.) 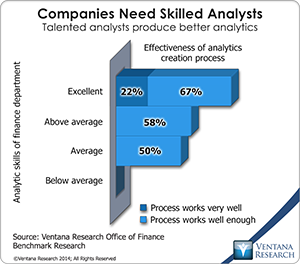 Finance departments have the ability and at least an implicit mandate to improve business performance and enable a corporation to execute strategy more effectively. Yet the research shows that becoming strategic is a work in progress. Most departments handle the basics well, but half fall short in areas that can contribute significantly to the performance of their company. More than three-fourths of participants said they perform accounting, external financial reporting, financial analysis, budgeting and management accounting well or very well. But only half said that about their ability to do product and customer profitability management, strategic and long-range planning and business development. 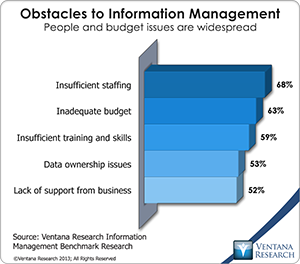 When applying information technology to drive better business performance, companies and the systems integrators that assist them often underestimate the importance of organizing data management around processes. For example, companies that do not execute their quote-to-cash cycle as an end-to-end process often experience a related set of issues in their sales, marketing, operations, accounting and finance functions that stem from entering the same data into multiple systems. The inability to automate passing of data from one functional group to the next forces people to spend time re-entering data and leads to fragmented and disconnected data stores. The absence of a single authoritative data source also creates conflicts about whose numbers are “right.” Even when the actual figures recorded are identical, discrepancies can crop up because of issues in synchronization and data definition. Lacking an authoritative source, organizations may need to check for and resolve errors and inconsistencies between systems to ensure, for example, that what customers purchased was what they received and were billed for. The negative impact of this lack of automation is multiplied when transactions are complex or involve contracts for recurring services.